So today starts the Countdown to 2016, hosted by Sarah at Fantastical Sharing of Recipes! I love looking back at the blog from the past year and remembering my favorites. I'm always a little conflicted, though, because I like everything I post - I wouldn't share it with you if I didn't like it. But I can't use this space to recount every.single.recipe posted this year so I have made some tough decisions! Over the next week, we'll look back on best breakfast, main dish, dessert, crockpot, the most popular posts, and then what I definitely want to make in the New Year! It will be a fun week so stop back every day. For today, I'm sharing my favorite appetizers and snacks of the last year. I don't do a ton of posting of this category, but what we make a lot of at my house is flatbreads! They are such a versatile thing - can easily be a meal or an app or a snack, you just cut them in different sizes. And the toppings are limitless, just like pizza. These are two we make again and again. And they never get old. I hope you'll try them, too! Covered in shrimp, artichokes and roasted red peppers, this is a trip to Greece without the airfare! Two simple toppings, one glorious result! I love using flatbread to make mini pizzas. Your Sausage and Apple version really caught my attention. PINed it to try soon. 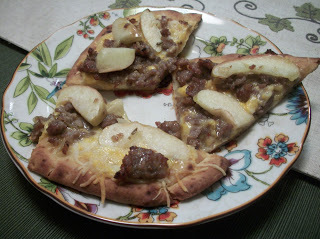 I love flatbread, now I have two new recipes to try. What's not to love about a good flatbread? That sausage and apple one sounds like a real winner! 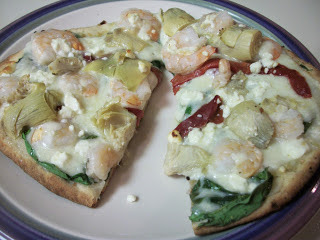 Flatbreads are such a great idea!